The Holiday Season may not be the best time to be concerned about sustainability and the environment. It's all about BUY, BUY, BUY. Heck, the term Black Friday, despite its morbid etymology is looked forward to with glee (at least for retailers, though Black Friday sales may not be all they're cracked up to be as an economic indicator). 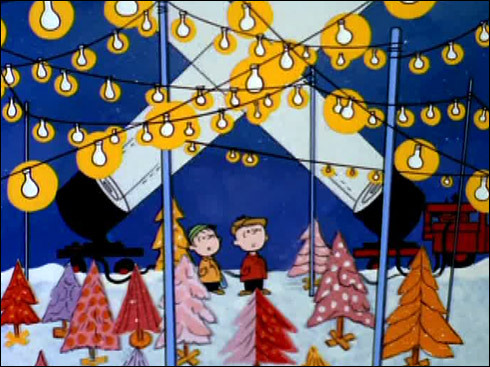 Even Lucy tells Charlie Brown in A Charlie Brown Christmas that Christmas is run by a "big eastern syndicate" whatever that meant to an eight year old in 1965. Guilt occasionally accompanies my acts of consumption, feelings that "buying of stuff" (perhaps phrased differently as "participating in the marketplace") is the root cause of much of our environmental and social justice concerns. what have I been reading (failblog, The Economist, Orion Magazine)? It dawned on me as I had lunch with an old friend a few weeks ago that guilt associated with participating in the market may be misplaced. He's working on the EASE Initiative, an interesting project linking organizations working along the value chain of social change while building a marketplace with a "do good" undercurrent. Another friend's soon-to-be active company here in New England believes in the need for markets, and has asked questions about the kind of markets they'd like to participate in and and come up with their own answers. Nearby Registry (coming in the Spring of 2012) will engage people in the tradition of gift-giving for special life events while supporting local businesses and building community capital. The conclusion I've drawn from these two examples? It's not the act of consumption that is the problem, it's how we consume. Participating in markets and consuming goods has been a part of human culture since we organized settlements 12-15,000 years ago. It was the way we connected with each other and obtained the goods we needed. It was a RELATIONSHIP economy and in it's purest, earliest form it was strictly trade; you traded with someone you trusted and with whom there was a mutually beneficial need to trade (my bushel of dried cod for your sweet flint, animal hide, and oak-handled handmade axe). While we traded we built social capital among our tribes and villages, such that when the guy I traded my cod with had an issue with a bear, I might help out. As our societies and economies developed we moved from relational purchases to transactional purchases, with the pace accelerating as we tapped into the wealth of stored solar energy that is fossil fuels over the past 200 years or so. Much of the social capital developed through relational transactions as you picked up books, shoes, groceries, coffee, etc. at your local merchants is now missing from villages, in essence "shipped out" to centralized, on and off-line retailing companies. Trust is still a factor - the fact that Amazon can launch a campaign during the Holiday season encouraging people to act as their market research associates by using local independent bookstores as showrooms for $5.00 illustrates this point. What does this say about who we trust and what we value? So, were am I going with all this? What kind of markets do we want? What businesses do you trust? What businesses do you want to trust? I've bought stuff online (a lot of stuff - and from Amazon too) and I'm not advocating that we return to a barter economy (though, depending upon what you read and believe, that could happen whether we want it or not) only that we pause to think about what we buy, how we buy, and why we buy and what the answers to those questions mean to us as individuals, our communities, and the world around us. Here are a few resources that I found interesting...I am sure there are many more. What do you have to say?